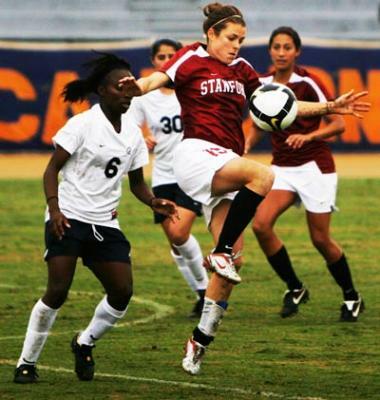 Although a legitimate professional women’s soccer league has stopped and started a few times in the United States, the pool of outstanding teams and players at the Division 1 college level continues to grow as the little girls who grew up cheering on Team USA in past World Cups come of age and enter university. Women who play soccer at the 200+ D-1 schools that field teams can expect to get a full or partial scholarship in most cases, but they will be expected to devote hundreds of hours to their training and team. "Total time investment for a player? Roughly 1000 hours a year (three per day)." Millions of American girls have grown up with the sport, and spurred by the Title IX legislation in the States (which guaranteed equal sporting opportunities for women at U.S. universities), have raised competition for spots on college teams to new heights. Because that jockeying for spots has gotten so intense, D-1 programs and coaches realize that they can ask much from their players, because if one does not want to sacrifice time and effort for the team, there are 100 others who gladly will. Teams usually play about 16 games, plus conference tournaments plus the national tournament, when the top 64 teams are invited to a multi-weekend play-off that culminates in December. The competitive season runs from late August to November, although the national championship is usually played on the first weekend in December if your team gets that far. Total time investment for a player? Roughly 1000 hours a year (three per day). If you are not willing to give three hours a day to your development as a soccer player, then you should not strive to play at the D-1 level. However, if you are serious about your game, then a Division 1 program can be a godsend. Playing with probably the finest pool of young players in the world will only help you to get better. The hefty slate of games gives many opportunities for competition, and D-1 teams play in stadiums that range from a few hundred in capacity to up to 6,000. Those stadiums are sometimes filled for big games against top rivals. This training and competition schedule is overseen by a generous staff that usually includes a head coach, two or more assistant coaches, a trainer and several interns, a team physician, surgeon and two managers or more. Top women’s teams are able to employ so many staff members for two primary reasons: 1) women’s soccer is a decent draw at many schools and gets some income from gate receipts at games; 2) most of the top teams are at schools with outstanding men’s football teams, which bring millions into the athletic department budget. The top five teams in women’s soccer looked like this at the conclusion of the 2011 season: Stanford (Palo Alto, CA), Duke (Durham, NC), Florida State (Tallahassee, FL), Wake Forest (Winston-Salem, NC), Oklahoma State (Stillwater, OK), a revealing parity, with each region of the U.S. represented, and a far cry from the time when the University of North Carolina won the championship almost every year. This diversity of top teams in different regions is emblematic of the development of D-1 women’s soccer in the past decade. It is interesting to watch as some Division 1 schools have had to cut sports due to reduced state funding and a general economic slowdown in the U.S. In almost every case, women’s soccer is not on the chopping block, which is great news for prospective players. Most of the sports cut have been men’s teams, with wrestling, track, and swimming and diving among the top targets. As far as going to university to major in a demanding field of study, it will probably prove very difficult to do that in just four years with the above regimen. Many college athletes attend summer school to complete their studies in four years while remaining on campus to train with teammates. All NCAA athletes have just four years of eligibility to play sports, unless an injury sidelines a player for a significant portion of the year. In short, playing at a Division 1 level in women’s soccer can be a challenging and grueling experience, but one with significant rewards for those who love the sport and are able to persevere through hours of training in the midst of a full school schedule. It takes tremendous self-discipline to write lengthy research papers while on road trips on noisy buses and in hotels where everyone is a bit antsy for action. Yet, there is probably no better training for future professionals than at American D-1 programs. Even if after your studies you don’t go on to compete in a professional league in Europe or Asia, you will have received a free (or reduced-expense) college education with a marketable degree in hand and many contacts in the U.S. for future employment. With the continuing growth of girls’ sports in the U.S., there are also abundant coaching opportunities at many levels all over the country for those who want to stay connected to their sport. Perhaps women’s soccer will go the route of women’s professional basketball in the U.S., with several bumps along the road resulting in a professional league powered by a sustainable business model. The women’s league will probably make a re-appearance in the next year or two as the men’s league (MLS) grows in attendance and salaries and the women’s game receives a post-Olympic bump.